There’s nothing quite like a good walk. It doesn’t require a gym membership or a bunch of equipment, and often gets you into the great outdoors. It’s also very good for you, both physically and mentally. 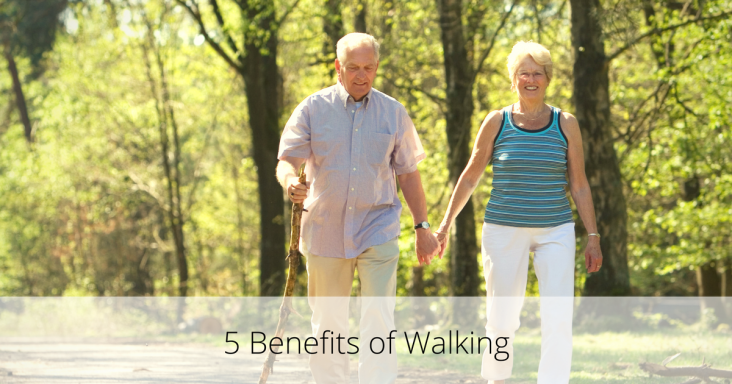 Indeed, all of the benefits of walking would make for a long list, but here are five main benefits that can inspire you to lace up your walking shoes and get moving. You know how it is at the end of a long, trying day. You get home and are looking for something to help take the edge off a little bit. And a great way to do just that – is by taking a walk. Studies show that walking affects our nervous system, so that we’ll feel a decrease in anger and hostility. Furthermore, walking outside exposes you to sunlight, which helps you cope with Seasonal Affective Disorder. It has become clear in recent years that prolonged sitting has many negative health effects, including the damage it causes to leg arteries. But one study showed that taking even three, five-minute walks a day can reverse this damage. If your job entails prolonged sitting, it’s helpful to take a short break every hour and go for a quick stroll. We’ve already mentioned how great walking is as a stress-reliever, but it also improves your circulation, and helps give you a sense of overall calm. In turn, these factors boost your immune system – which helps your body fight diseases; from the common cold, up to more serious health problems. Walking has even been shown to lessen menopause symptoms for older women. Walking lowers your blood sugar levels and your overall risk for diabetes (according to the American Diabetes Association). Another study showed that regular walking lowered blood pressure, and may significantly reduce the risk of stroke. Studies also show that those who walked regularly, and met minimum physical activity guidelines had a lowered risk of cardiovascular disease. The research is in: Walking and other physical activities will improve your creativity and help you find solutions – like those often faced at work – to tricky problems. A study showed that walking produced twice as many creative responses in participants that walked, than those who were sitting for long periods.